Most recognized in the early days for their excellent singles, such as the 500 cc Manx and International, Norton commissioned engineer Bert Hopwood to design their first vertical twin, the Dominator, around 1950. Starting as a 500, this engine gradually increase in size to 600, 650 (Manxman) and 750 cc (Atlas, P11) into the late 60s. Norton handling was considered legendary, with class-leading Roadholder forks and Featherbed frame. While Norton handling may have been class-leading, likewise were the high vibration levels of the long-stroke and aging 750 engine. Without enough resources to design and manufacture a completely new motor, in 1968 Norton did things the English way and produced a new, rubber-isolated chassis instead. So was born the Commando, which gave Norton another few years of breathing room, before an anticipated new drive-train might be built. Such was not to be the case. Even enlarged to 850 cc with electric start (the Mark 3), the Commando was increasingly losing the horsepower and quality wars to the Japanese and European builders. The 50s era Norton engine, overstressed and nearly ancient by the standards of the 70s, suffered under the tightening emissions, noise requirements and warranty claims. Declining sales and obsolete production methods eventually buried the marque. 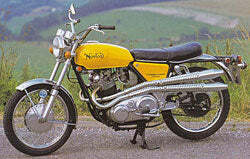 Norton Commando production ended in 1975.